How Can I Go Absolute Hair Design LLC? Where is Absolute Hair Design LLC in Marriottsville on the Map? This location has 11 reviews from customers. What a great place! I started going here after following my hair stylist, Dora, as she switched locations. Dora is fabulous! I drive in from Towson to have her do my hair. She has such a fun, spunky, and friendly personality, and I trust her hair styling skills 100%. I usually just come in and tell her to do what she wants because it always ends up being perfect. She's very knowledgeable in the field and is also extremely skilled in coloring. She did an amazing job on my first highlights. I couldn't be happier! This is a great salon. Everyone is friendly and very accomodating. Dora is my stylist. I followed her to this salon after she left her previous one. She has great ideas on cut and color. She has been honest with ideas that I have come in with and works with my sometimes difficult hair. She is flexible when squeezing me in for a quick bang trim too. I highly recommend this salon and Dora in particular. I visited Absolute yesterday for the first time after my stylist (Jennifer) moved there from her old salon. 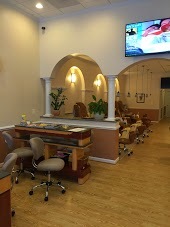 The salon is clean, spacious, and beautifully designed! I just recently started going to Jennifer, but she has done an amazing job every time I've seen her. I would highly recommend Absolute Hair Design to anyone who wants a great haircut at a great salon. Laurie (the owner) has done an incredible job with the salon. While the location is a little out there, it's only about 15-20 minutes from Columbia and Mt. Airy, MD. A good haircut is well worth the drive though! Absolute Hair Design is a hidden gem in Ellicott City; I followed Dora there from her other salon and as always, love Dora, and now, love the salon. At my first visit, the owner jumped in and shampooed my hair and was extremely friendly. Dora is amazing and is the only stylist I will trust with my hair. I have very long, THICK hair, and Dora always does a great job. She also did my wedding hair! Go see her, you'll be happy you did! What a great place this is... modern, comfortable, and professional. My stylist, Dora, is excellent! I drive from Towson to get my hair cut by her and it's always worth the trip. My girlfriend and her sister are stylists and they always compliment Dora's work...and that says a lot I think. Highly recommended!